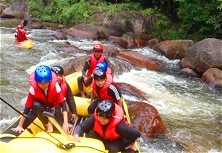 Always wanted to go white-water rafting in Malaysia? Experience the adventure of a lifetime! White-water rafting's popularity began to grow when it became part of the Olympic Games in the 1970s. Today it's estimated that between 9 and 10 million people have tried white-water rafting. In fact, about 3 million rafters seek out adventure by running a river more than twice a year! White-water rafting is one of the most exciting outdoor activities for families and friends. It's also one of the most popular activities we organize for company outings. White-water rafting is the kind of adventure that's simply awesome to do in a group, and our white-water rafting weekend will, without exception, be an unforgetable one for all. 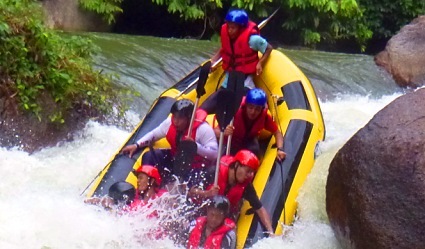 Malaysia Sea Sports offers various types of white-water rafting, so we can always match the location of the river and intensity of the ride to suit your group. Our guests often ask, "Which river trip is best for us?" We usually encourage families and first-timers to begin with a modest intensity river, and then gradually go for the more high-octane adventures. To help you pick your white-water rafting adventure, please see our frequently asked questions. If you don't see your question here, by all means let us know. Call us on +65 900 79345, or Email us. Rafters are encouraged to wear sports attire such as sports shoes or strap sandals, shorts or any kind of sports pants. Jeans are prohibited for safety reasons, as they get very heavy when waterlogged and also restrict movement. River length and rafting duration? The Kuala Kubu Bharu and Ulu Slim river distance is around 7km. 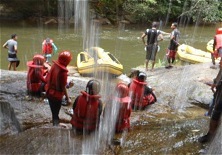 The rafting will be about 2 hours of jam-packed wet and wild fun. How to get to your location from Singapore? From Kuala Lumpur to our rafting location will take about one hour. Apologies, we do not arrange a transportation in our package at this moment. Please contact any taxi company or go by bus. You can book either from this company, because they cover the whole of Singapore and Malaysia. How to get to your location from Singapore KL? From Kuala Lumpur to our rafting location will take about one hour. You can take a taxi or a bus. Click here to book from this company, because they cover all of Malaysia. Please note that, given availability, bookings need to be made at least a week in advance if there are fewer than 20 rafters. A 30% deposit is required. If your grou has more than 20 rafters, then the booking needs to be made at least two weeks in advance. Please note that for groups this size, a 50% deposit is required. Can we use credit card? We do accept deposit payments using credit card, since PayPal is our transaction provider. PayPal payments are simple, safe, swift and secure. Just follow the steps. Do let us know if you have any questions. For the KKB River, the minimum age is 15 years old. For the Ulu Slim River, the minimum age is 5 years old. Please note that for safety reasons, a rafter's maximum weight cannot exceed 100 kg. What does the rafting package provide? Our package incudes lunch, equipment and our rafting guides. Any issues with contact lenses or spectacles? Wearing spectacles is fine as long they're secured by a strap. Wearing contact lenses is generally fine also, so long as you don't keep your eyes open when you get splashed full-on or become submerged. - How are rivers rated for difficulty? Grade 1 - Easy. Few or no obstructions; fast moving water with riffles; risk to swimmers is slight. Grade 2 - Novice. Wide clear channels; occasional maneuvering; rocks and medium-sized waves are easily avoided by trained paddlers; risk to swimmers is low; assistance is helpful but rarely needed. Grade 3 - Intermediate. Rapids with moderate, irregular waves which may be difficult to avoid and capable of swamping a canoe; complex maneuvers in fast current and narrow passages require good boat control; large waves, holes and strainers may be present but are easily avoided; powerful current; scouting advisable; swimmers are unlikely to be injured but assistance may be needed to avoid a long swim. Grade 4 - Advanced. 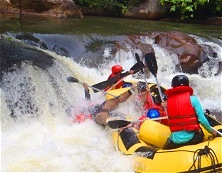 Intense, powerful rapids; turbulent water; may involve long, unavoidable waves, holes or constricted passages demanding fast maneuvers under pressure; may require "must" moves above dangerous hazards; risk of injury to swimmers is moderate to high; group assistance to swimmers requires practiced skills. Grade 5 - Expert. Long, obstructed, turbulent rapids; drops may contain very large unavoidable waves, holes or steep congested chutes with complex demanding routes; several of these factors may be combined at the upper level of this class; rescue is extremely difficult; above average rescue skills are essential. Grade 6 - Almost Impossible. Difficulties of Class V are carried to the limits of navigability; very dangerous; risks are high and rescue may be impossible; for teams of experts only under favorable conditions. Book your white-water rafting slot now. We'll get back to you within one business day to confirm your booking.